For this card, I covered the front of a 6″ card with Kaisercraft Pickled Pear paper, and then Die cut a window in it using one of the Stampin Up Labels die. 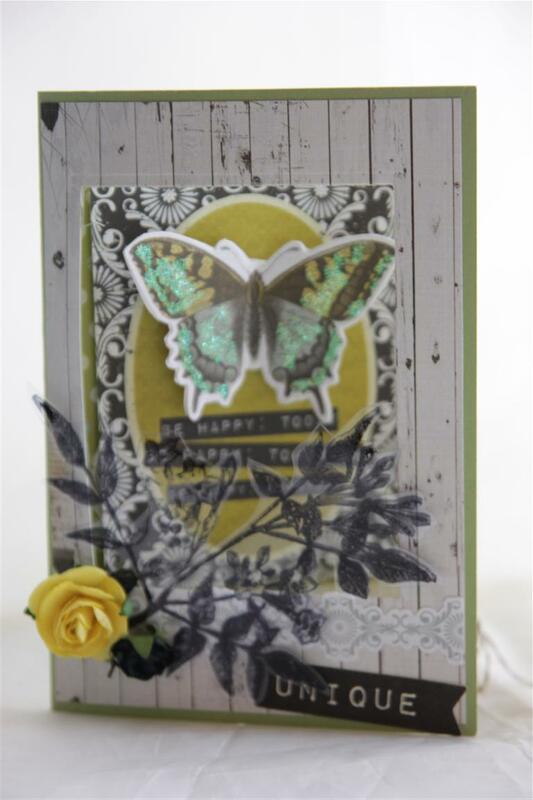 I covered the inside of the card with more paper from the same ( gorgeous) collection, and decorated the inside and out with flowers, fussy cut butterflies, and a leafy branch that I stamped on to Acetate and cut out, using one of the stamps from Kaisercraft Pickled pear stamp set. Tomorrow we will go back to Kaisercraft flora delight paper, for now I am off into the craft room – I haven’t been well this week, but much better today, and feel in the mood for some crafty therapy! Til tomorrow…. Today I taught a class with my lovely ladies using Kaisercraft Pickled Pear papers, so thought it would be an idea to show a couple of other cards I have made using this paper collection over the next couple of days. I also used the matching collectables, and a prims canvas bird, which I coloured with a sponge a nd distress inks.The lovely branchy bits is made by stamping a kaisercraft pickled pear stamp onto acetate and cutting out. I will definitely be found in the craft room tonight, so looking forward to it! til tomorrow…. 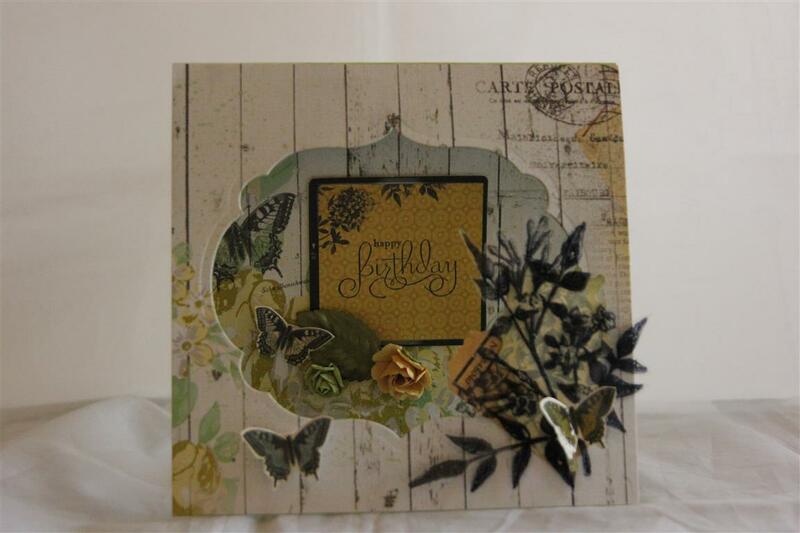 Todays card is another card in a box, and I am busy in the craft room making more of these for an order. 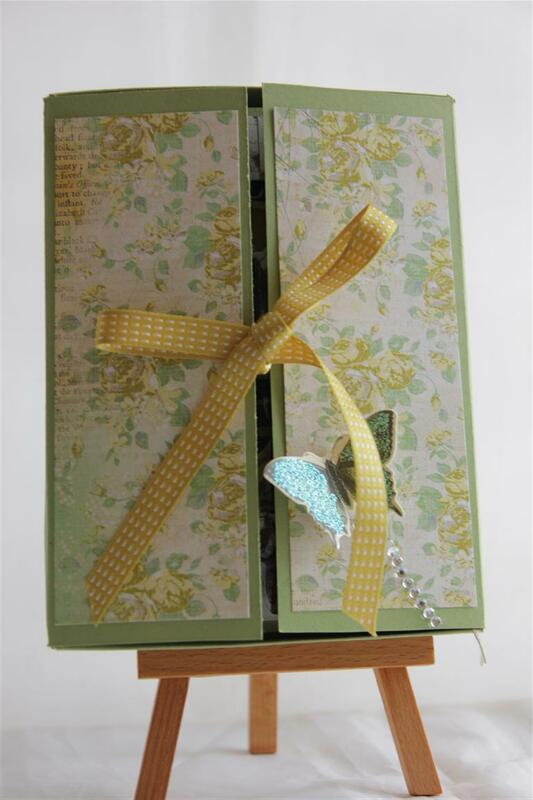 For this one, I used stampin Up cardstock – certainly celery, and Kaisercraft patterned paper – pickled pear. I do like this paper, and have made another card with it which I will show you tomorrow,in the meantime for this one I cut a rectangle out of the fromt of the card using a spellbinders die, and covered the front with some of the paper. I used a stamp from the matching stamp set to stamp onto acetate with black stazon ink and cut it out. this worked a treat and I will be doing this again!I stauck a panel from the paper that had an inspirational sentiment on it to the insiside of the card, and popped on a butterfly sticker from the pickled pear sticker sheet.After all that it was just a matter of flowers, ribbon and bling to finish. That’s it for today – it’s back to the craft room for me…Til tomorrow….